Babywearing in Canada has set a whole week (May 21st to May 28th, 2016) to celebrating all things babywearing. This got me thinking about babywearing in my life. When I had my first I knew it was something I wanted to do. We got our first carrier before he was even born. But I didn’t become a daily wearer until my second son was born. That’s when babywearing became a necessity. With an infant and a not quite two year old, there wasn’t much I did without having a baby strapped to me. Like what you ask? Anything and everything that would be easier with two hands! Dressing my first born, dealing with the fun and follies of potty training, grocery shopping (way better for babes back than keeping them in the bucket and saves valuable cart real estate! ), cleaning, walks to the park or around the block (we have a double stroller but I’m pretty sure it weighs 75lbs empty). It was pretty common for my husband to come home to me either in the kitchen standing at the stove with a sleeping babe on my back or perched on the edge of the couch, yarn in hand, with a sleeping babe on my back! After a few weeks of regularly wearing my youngest I said to my husband “why didn’t I do this when we had only one? Think of how much more enjoyable some tasks would have been”. My one arm was always so sore from trying to carry him or the bucket seat. Even now, my youngest was sick this past week and just didn’t have the energy to walk, so I popped him on my back in the carrier when we got to daycare to pick up my oldest. Easy peasy! Someone in a Facebook group once asked people to “post a picture your first experience with babywearing”. My mind instantly thought of a few old pics. But they weren’t of me wearing either of my boys, they were of my parent’s wearing me. My mother grew up in Africa and babywearing was just something everyone in her life did. So I think that for her it was a totally natural and normal way to parent, especially with a little one who never wanted to be put down. Before the invention of bouncy seats, swings, jumpers and saucers, babies were worn. It’s the perfect way to bond with your baby when you have to be (at least) a semi-productive adult. 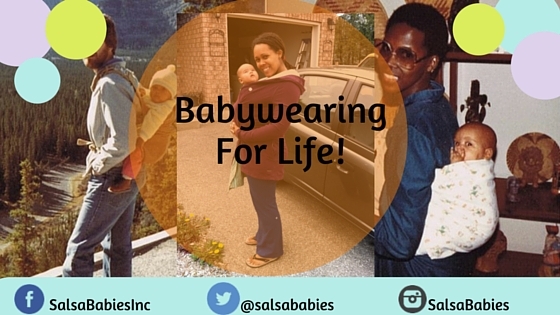 For me, babywearing is about convenience, community, career and a connection to my past and I’m so grateful for it!